A co-working space in Venice. Photo courtesy Podshare. Maybe you’ve stayed at a hostel while traveling. 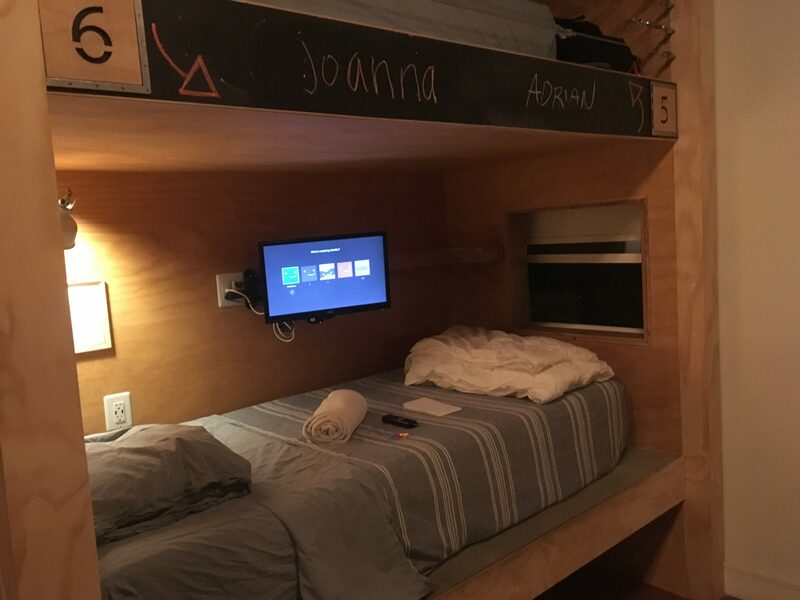 Some LA residents are using Podshare as a long-term housing solution, sleeping in bunks with a roomful of strangers for months at a time. With LA’s rising rents and dwindling housing stock, Angelenos are getting creative with the way they live — whether it’s renting out a room on Airbnb or moving into an RV. And now we can add another option to that list: pods. Elvina Beck was inspired to create her company Podshare in 2012, after struggling to find a roommate for her $2,000 a month apartment in Downtown L.A. She decided to try out Airbnb and was hooked. “I’m an extrovert and I really vibe off other people’s personalities and their stories and love chatting over dinners or breakfast,” she said. A pod at the Venice location. Photo by Joanna Clay. 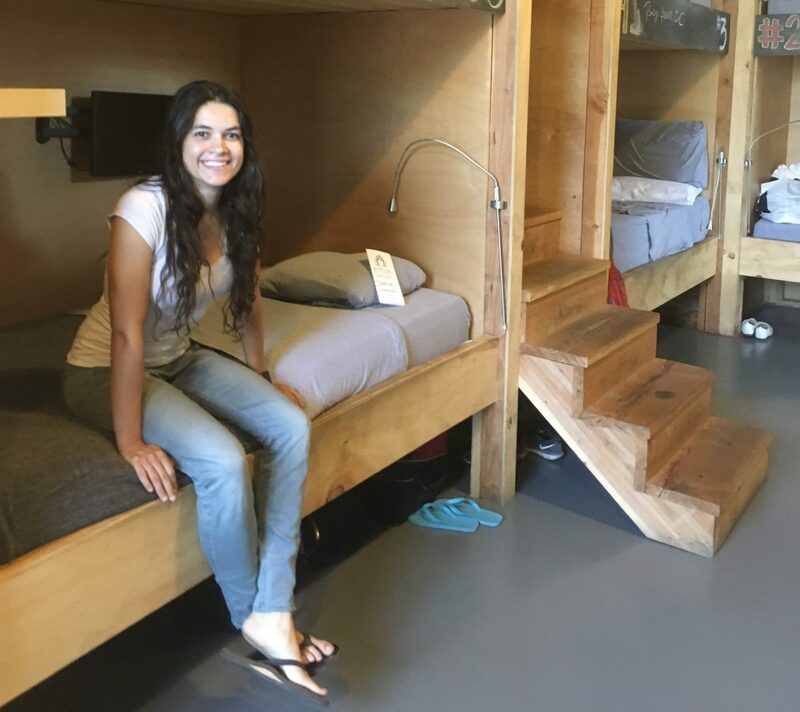 She wished there was a housing model for co-living that tapped into her need to connect and also allowed housing to be affordable in big cities like Los Angeles. And that’s where pods come in. Pods are three-walled wooden nooks with all the essentials — a bed, a shelf for odds and ends, a flat-screen TV and a hook for a bath towel. There’s no privacy in a Podshare — don’t try to hang a towel or curtain to close yourself off. You will get in trouble. The idea is to live communally. Each pod has a chalkboard for “podestrians,” as they are called, to write their names. There’s a large kitchen, where folks are encouraged to cook together and share meals. There’s also a lounge and co-working areas. 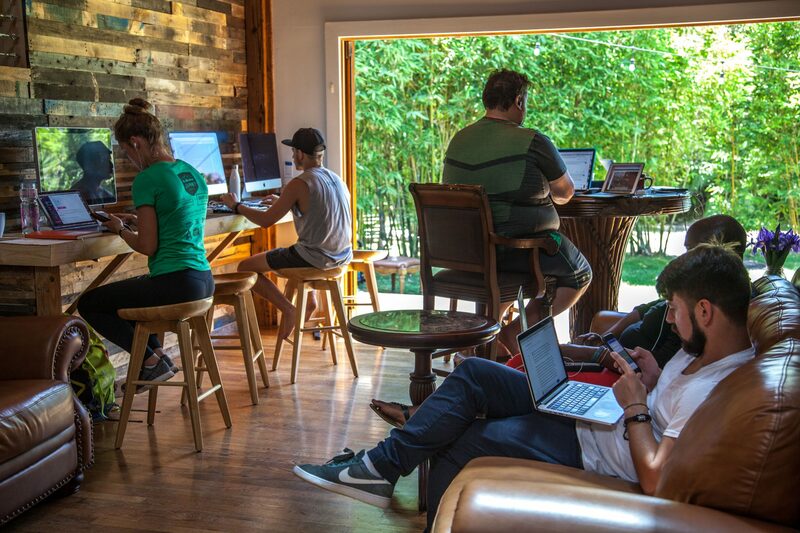 The co-working space at the Venice Podshare location. Photo by Joanna Clay. Beck remembers when she opened her first Podshare in Hollywood. She sketched out her idea for her first pod on a napkin and called her dad in New Jersey. He was her first skeptic. “He’s like, sounds like a really bad idea. I think people want privacy,” she said. But he flew out to LA anyway and helped her build those first pods. And now, he’s kind of eating his words. Six years later, Beck has five locations across Los Angeles — including 90 pods in Westwood, 40 pods in Venice and seven in Los Feliz. Her pods are practically full around the clock, with a 90 percent occupancy rate. It’s 50 bucks a night, $280 a week and $1,000 a month for a pod, but that price can go up depending on where you stay and if you choose a queen-size pod. Beds stacked two-high, like bunk beds, might conjure “hostel,” but Beck bristles at the comparison. It’s true. While the majority of her guests — 60 percent — are travelers, the other 40 percent fall into two groups, transitional and temp. 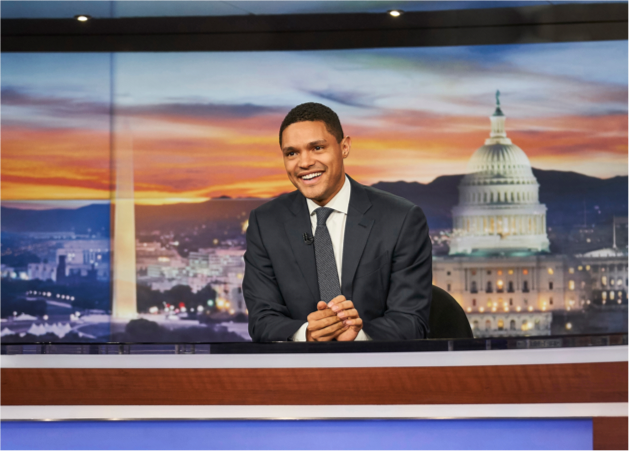 Temps might be in LA for pilot season or for an internship. Transitional residents might stay in a pod while they search for an apartment or look for jobs. 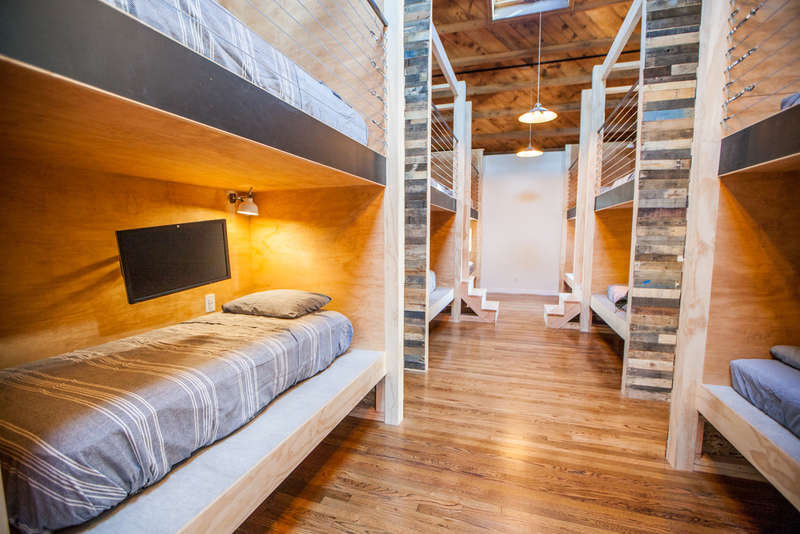 The Venice Podshare features a co-working area. Photo courtesy Podshare. Peter Stechman, 23, would fall into the latter camp. He stumbled across Podshare while living in a shared apartment across the street. He pays $1,400 a month for his pod. It’s certainly not cheap but to put it in perspective, median rent in LA County is $1,264 (including utilities) while the median household income is $57,952, according to U.S. Census data. If you look at a city like Santa Monica, a short drive from the Venice Podshare, median rent is higher at $1,626. 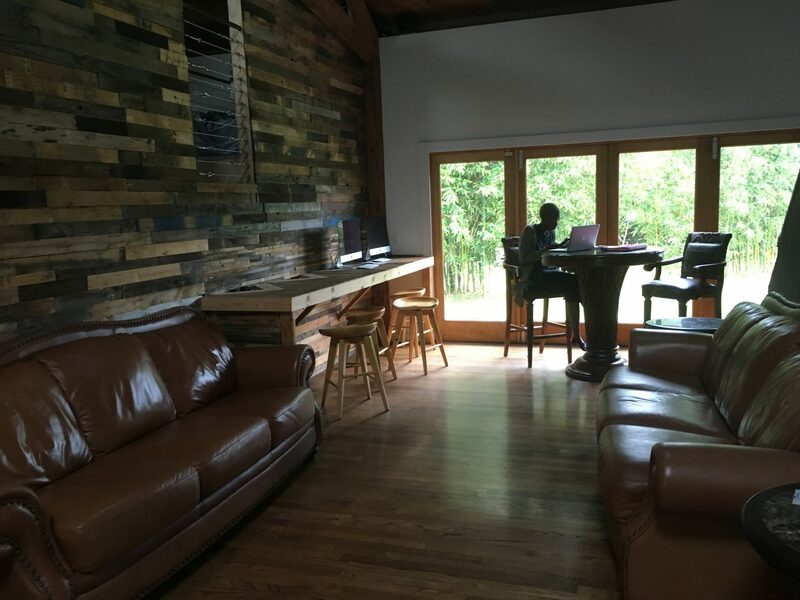 Another way Podshare differentiates itself from a hostel is its quiet hours, which are strictly enforced from 10 p.m. to 10 a.m. Then there’s the co-working aspect. Each location has a type of co-working space — Hollywood has a podcast studio and Venice has a private upstairs conference room. Guests have access to all five locations while they stay, in case they want to take a load off while sightseeing in Hollywood or lounge in a hammock after wandering the Venice canals. People who aren’t staying the night can purchase $15 day passes. With all the pluses of Podshare, there is one big drawback — no privacy. Beck can relate. She’s been living in pods since 2012. Elvina Beck in her pod. Photo by Joanna Clay. Beck wants to expand Podshare in Los Angeles County, and is considering opening locations in Culver City and Santa Monica. After that, she’s thinking about Northern California. She thinks Podshare could eventually disrupt our idea of housing.